There is no doubt that patients are some of our best teachers. They are really the important bottom line of everything we do at MCG, from the physicians we educate, to the discoveries we pursue, to the care we provide. One of my earliest lessons from patients and families was the reality that even when treatment fails, your presence and words as their physician will resonate. That is a definite privilege and tremendous responsibility. It is my distinct honor to share with each of you that this year, for the first time at the annual Exemplary Teaching Awards ceremony, we recognized the invaluable contributions of patients and families who stand in front of a classroom and teach our students these kind of invaluable lessons. Our first honorees included Karen Strite and her son Wade. Wade has Down syndrome and his mom shared that the lessons he has taught his family in his 12 years of life are also invaluable. Wade showed them that they can learn from those who are different and who have perhaps more simple, but also distinctly profound ways of thinking. Wade has opened the door for his family to diversity and to the beauty of the differences between us. At a Down syndrome conference they attended years ago, the Strites realized that they could help the next generation of physicians learn these lessons as well. So a decade ago they came to MCG to teach. Dr. Anna Edmondson, course director for Human Gross Anatomy, says that Wade and his mom have been inspirational in both the love they share with each other and the joy and accomplishments Wade radiates as a result. Mrs. Strite tells us that in return, she and Wade have no doubt that future generations of moms, dads and patients with Down syndrome will be embraced by physicians who are educated at MCG. That is a legacy. Thank you Wade and Mrs. Strite. Our thanks to Thor and Judi Peckel as well who share from the teaching podium their journey with chronic kidney disease through dialysis and to Mr. Peckel’s kidney transplant. Dr. Pamela Fall, nephrologist and professor emeritus, shared how this engaging couple brought to life for our students the course of kidney disease and its impact. Second-year student Sunny Shin said Mrs. Peckel’s support throughout amazed her and showed the team effort the journey took. We appreciate the opportunity to honor them. This year 211 of our 3,000 plus faculty across Georgia also were recognized for their service. We talk often about MCG’s stellar reputation in physician education so there is always some very heady competition for these awards. I wish we could tell the tale of all our educators, but I definitely wanted to share that there were five educators honored in both the undergraduate and graduate medical education categories. These include Dr. Edward Agabin, associate director of the allopathic residency educational programs for the Department of Family Medicine and an educator for the family medicine clerkship for medical students; and Dr. Ram Bishnoi in our Department of Psychiatry and Health Behavior, who has only been on the faculty three years but already spends time every day lecturing and teaching students and residents. The dual honorees also included Dr. Paul Mann, a neonatologist in the Department of Pediatrics and avid educator in areas like Essentials of Clinical Medicine and Pediatric Research. And, Dr. Nikhil Patel, a cytopathologist and hematopathologist in our Department of Pathology immersed in teaching, including working one-on-one and in groups with residents as they learn skills like how to do fine needle aspiration and more about thoracic and lung pathology, and with students in team-based learning modules. The final double winner is Dr. Bunja Rungruang, gynecologic oncologist, who is MCG’s 2015 recipient of the exemplary teaching award for GME, associate residency program director for the Department of Obstetrics and Gynecology and who teaches students a myriad of courses. 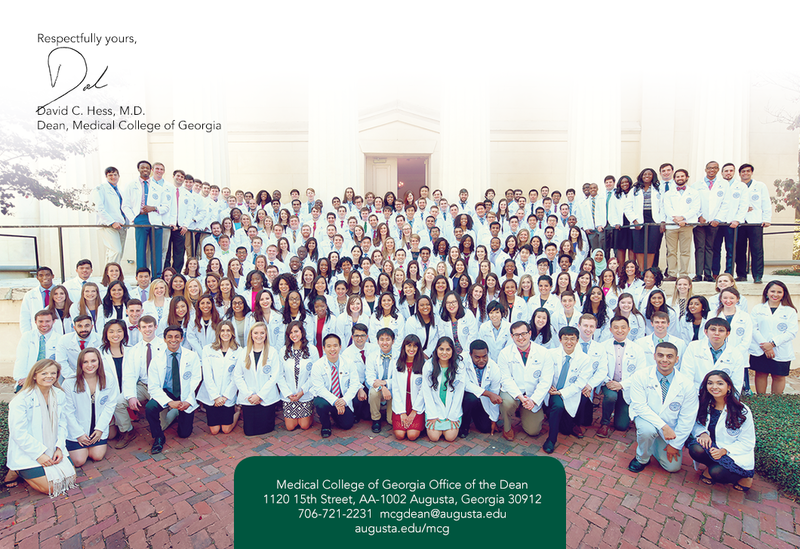 The excellent effort of these and many more faculty and staff will ensure that MCG continues to educate the best physicians and physician-scientists anywhere. Thank you. I want to thank as well Dr. Ralph Gillies, associate dean for faculty development, for leading this significant effort to honor educators. See all honorees. As another reminder that our students are as amazing as the faculty who teach them, I wanted to share that our freshman class, which is busy by anybody’s definition, is still planning a benefit talent show for March 8 at the Maxwell Theater on the Summerville Campus. MCG’s Got Talent will feature about 30 individuals and groups like standup comics, salsa dancers and bands – including that of our executive vice dean Dr. Vaughn McCall – found among our faculty, staff and students. Doors open at 6 p.m. It’s just $5 for MCG/AU individuals and $10 for others in advance and $7 and $12, respectively at the door. Another 20 people will display their visual art in the lobby. The other big plus is that proceeds from ticket sales and from concessions will benefit Child Enrichment Inc., a local organization that helps abused children. Please let me thank our Class of 2022 for this significant effort and the class’ community vice president Bharat Sanders for making me aware. See this link for ticket information. I wanted to note here as well that the talent show is book-ended by Second Look, which brings underrepresented in medicine students back to campus for a second look at MCG on Friday, March 8, and Revisit Day, March 9, which is open to accepted students who want to make one more trip to campus before making their final decision. These possible future students will be the special guests at MCG’s Got Talent, which will provide them an even better perspective on the quality of individuals already here. Our new Center for Healthy Aging, which is already working hard to improve the healthspan of Georgians, is holding its first major science meeting Feb. 26 in the Auditoria Center. The meeting features international experts in areas relevant to our aging population with sessions like Advances in Bone Biology and Nutrition and Research on Brain Aging, Dementia and Neurodegeneration. Some of these experts also are members of the External Advisory Board of Dr. Carlos Isales’ program project grant on how to keep our bones and muscles healthier as we age. That includes presenters like Dr. Ian Reid, endocrinologist and deputy dean of the faculty of New Zealand’s University of Auckland, who will discuss ways to prevent fractures in women who don’t yet have osteoporosis. My thanks to many individuals like Dr. Isales, bone biologist Mark Hamrick and biomedical engineer Meghan McGee Lawrence for their leadership here and well beyond on this essential aspect of our wellbeing. One of our residents is leading a different type of educational effort. Dr. Akbar Herekar, a third-year anesthesiology resident, was a medical student in Pakistan when a bomb ripped through a building in Karachi in 2011. One of the first to respond, Dr. Herekar became acutely aware of the need to train emergency responders in developing countries. He helped create the First Response Initiative of Pakistan to help the people there prepare for the aftermath of such disasters. Since then, the group has trained 10,000 people in basic life-saving skills. Last week, Dr. Herekar also trained a group of our medical students who will be heading to Uganda for mission work this summer. Students learned things like how to decide who to treat first and how to use what’s available to them at the time, like scraps of fabric for tourniquets, to save lives in disaster situations. Bringing this full circle, the students will be able to teach people in Uganda the same skills. Dr. Herekar also hopes to teach local school-aged children these same fundamentals. Thank you Dr. Herekar for this great effort and thanks to Ashley Osborne at WJBF-TV for telling the story. Finally today, I wanted to make you aware of another recent first in Augusta, this one the first procedure in this nation to inject stem cells directly into areas of the brain damaged by stroke up to 12 months after the event. Pisces lll, see https://pisces3.org/, is an international study designed to reduce the disability that can follow an ischemic stroke. This phase of the trial is focused in the United States and Dr. Scott Rahimi, endovascular neurosurgeon and 2002 MCG graduate, was the first in the nation to do this procedure. MCG Neurology Chair Dr. Jeffrey Switzer is a study PI, enrolling patients in this groundbreaking trial. While much of our work to date has focused on limiting stroke damage, there is a huge unmet need to aid recovery months later, and earlier phases of the study in the United Kingdom have shown promise to do that. Ashley Osborne also did a great job telling this story. Feb. 12 – Preparing for Promotion Workshop, 3:30-5 p.m., Health Sciences Building, EC 2207, presented by Dr. W. Vaughn McCall, MCG executive vice dean, and Dr. Lara Stepleman, director, MCG Office for Faculty Success. Register atfacultysuccess@augusta.edu.